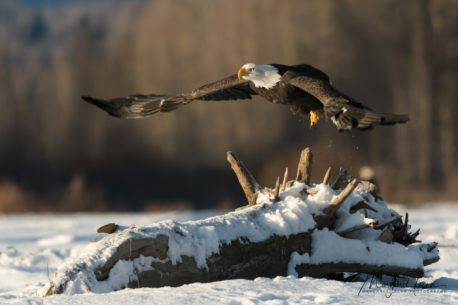 Bald Eagle taking off from a log on the banks of the Chilkat River near Haines, Alaska….. November 2017 The Chilkat River near Haines, Alaska is home to hundreds of Bald Eagles year-round. This population swells to several thousand during the month of November when Bald Eagles congregate to feast on a late-season salmon run, made possible by a unique geographical feature in the confluence of the Tsirku, Kleheni, and Chilkat Rivers resulting in a several-mile stretch of ice-free conditions in an otherwise frozen river. It is a privilege and an amazing experience to watch the eagles feeding and interacting with each other.